What is Lets Call Bull? LCB is a social sharing website that allows people to upload pictures, stories and fake news with images and their opinion. Then other users can look at the stories, leave comments and more importantly vote on if the story or image is true or 'bull', hence the name ‘Let’s Call Bull’. 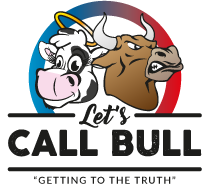 Why was Lets Call Bull set up? We created LCB because we live in a time of media saturation where celebrity rules and PR firms shape what we see and hear (this is all a bit serious sounding *gulp*). We were getting fed up with not knowing who to trust or what the truth is so we thought ‘hang on a minute’ why not give people a platform to rate stories and, via crowdsourcing, get a more balanced view of if they are true or not. It’s as easy as that, reliable honest news and stories get recognised, and ‘Bull’ is outed. Hopefully the results and comments will entertain and surprise you, but you can also get involved and get your thoughts and opinion out there (and that True news or Bull you’ve read recently off your chest?) If it also helps make you smile or a little happier then even better! What does LCB stand for? LCB = Lets Call Bull, sorry we should have been a bit clearer about that. Unless you meant, “What do WE stand for” blimey, this is sounding like you really want to get to know us maybe we should swap numbers . We don’t have any political motivation or affiliations we just want to give people a platform that helps clear some of the ‘Bull’ from the headlines. Don’t be coy what do you really stand for? Have a look around, get involved and thanks for taking the time to find out more about us.